This year we will be studying the Gospel according to John and the three Johannine Letters. We meet every other Tuesday evening from 6:30 p.m. - 8:00p.m. Our text will be the Bible (bring yours with you) and the New Collegeville Commentary: The Gospel According to John and the Johannine Letters by Scott Lewis (pictured here). Classes begin on October 10, 2017, continuing for 15 sessions. We will meet in the Education Building in Room 1. We look forward to learning and sharing together! 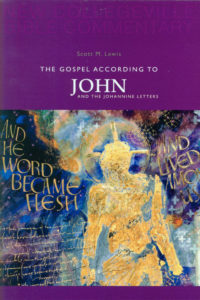 “The Gospel According to John and The Johannine Letters” by Scott Lewis is available from Liturgical press at www.litpress.org or 1-800-858-5450. PLEASE CONTACT CATHY KENT IF YOU WOULD LIKE HER TO ORDER YOU A COPY OR MORE INFORMATION.